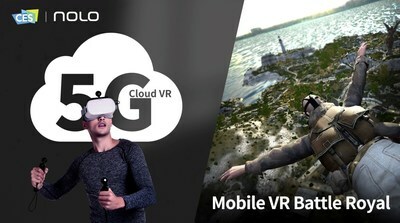 LAS VEGAS-- On the first day of CES 2019, NOLO VR presented their latest 6DoF positional tracking kit as a part of the 5G cloud VR model and announced the new 6DoF mobile VR battle royale game exclusively for the hardware. The NOLO CV1 tracking kit consists of four components: a base station, a headset marker and two controllers, all of which are designed to work out of the box with the mainstream 3DoF headsets. With the NOLO HOME streaming software, users can stream the graphics of PC-rendered VR games to the standalone headsets with simple setups. NOLO CV1 creates a totally immersive VR experience thanks to its six-degrees of freedom motion tracking, and it also features low latency to diminish the risk of dizziness, as well as 7-hour battery life in the controllers for extra long gaming sessions. NOLO VR has already developed different levels of collaboration with the Chinese carriers, such as China Mobile, China Telecom and China Unicom, to accelerate the commercialization of 5G cloud VR. As the only provider of the 6DoF VR input device, NOLO VR continues contributing in the 5G Cloud VR project. Today, the company showcased a high-quality VR experience by streaming the game graphics from a PC to a standalone VR headset. While the PC represents the V-GPU, the router stands for 5G mobile data, the standalone headset is the display, and NOLO CV1 works as the tracking and input device. This demonstration indicates the future solution of the 5G cloud VR, which would make full use of 5G mobile data and make VR more convenient and accessible. Speaking of the new 6DoF mobile VR game on NOLO's mobile VR platform NOLO HOME, Survive: VR Battle Royale is the first VR Battle Royale game on the mobile devices, featuring 6DoF tracking support and multiplayer online PVP. The developers behind this game, Raptor Lab, is the same team of the PC VR battle royale game Stand Out: VR Battle Royale. While the game was just awarded as one of the best VR games on Steam, it was easily ported to NOLO HOME within a short period of time via NOLO SDK. Considering this is the first step into mobile VR, NOLO VR has already collaborated with hundreds of VR developers and will continue to bring more quality 6DoF SteamVR experience to the mobile platform. The NOLO CV1 tracking kit not only supports Oculus Go to play 6DoF SteamVR games, but is also compatible with all mainstream 3DoF VR headsets. Therefore, along with NOLO's booth, NOLO CV1 can also be found all over the exhibition hall, including the booths of Huawei, Skyworth, Emdoor, and Dreamworld. NOLO CV1 is now available on Amazon.com. During CES 2019, NOLO is offering a special deal of $169 for CES audience only. For more information, visit https://amzn.to/2Jgjagm.